Whilst Apple have confirmed that the iPad will be coming to the UK at the same time as the US they are yet to announce any pricing. So where the US is getting charged a very reasonable $499 (starting price), we don’t yet know what us in blighty are going to get charged. I’m not one to let a little thing like a complete lack of facts hold me back though! 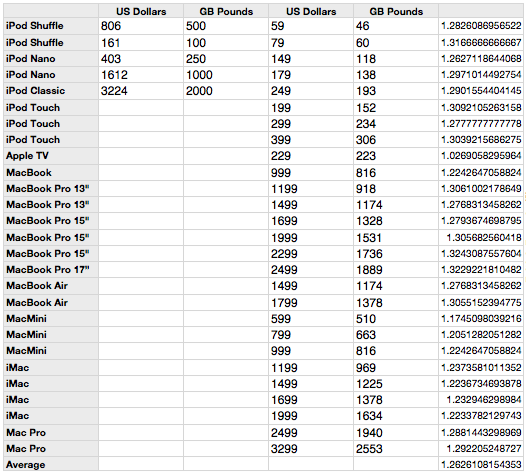 Here I’ve taken the entire Apple line up, from the iPod Shuffle through to the MacPro and plotted the US and UK prices on a graph. 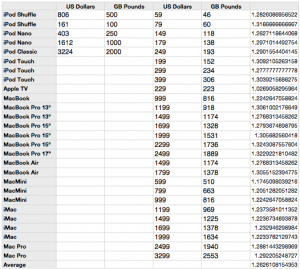 From that graph we can extract some interesting information, and use that information to predict the price of the iPad. 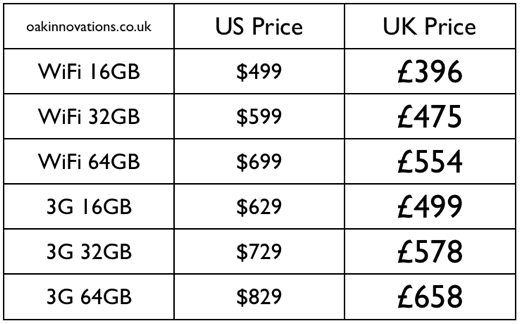 Comparing Apple's US prices against its UK prices. 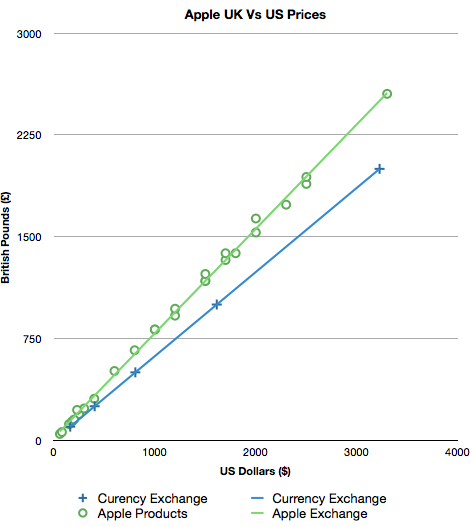 The trend shows it ahead of the exchange rate. A couple of things to note about the graph. The second line you see is a control data set. This is the current (as of 29th January 2010) exchange rate between the USD and GBP. It also needs to be pointed out that the UK prices include VAT (Value Added Tax) at 15% whereas the US prices do not include any state sales taxes that may be applied. In the UK we pay tax, so I think it’s fair to include it here. I’ve omitted the iPhone from the data because it’s subsidised price would potentially have skewed the data in one direction or another. So what can we do with this data? Well, the first thing we want to do is use it to figure out the price of the iPad. To do this we need to take the Average Apple Exchange Rate. This rate is, rounded to two decimal places, 1.26. 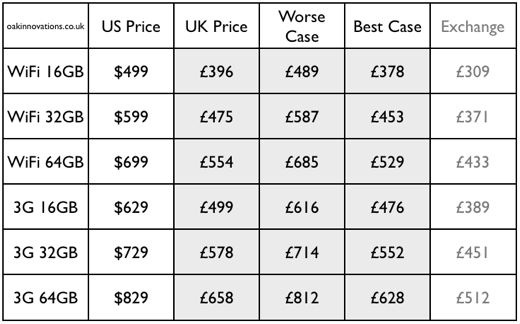 So, on average, to get the US price from the UK price you multiply the UK price by 1.26. Or in the reverse, divide the US price by 1.26 in order to get the UK price. So what do we end up with as far as iPad prices go? I think all those prices look realistic. What remains to be seen is whether Apple rounds up or down the prices. They do this in the US, and they occasionally do it in the UK, but not consistently. So for a WiFi only, 16GB version of the iPad, expect to be paying in the region of £395. £475 for a WiFi only 32GB version and £554 for a WiFi only 64GB version. If you want 3G then add approximately £103. However, digging a little deeper into the figures we can see that whilst the average exchange is approximately 1.26, there is quite a wide spread. The Apple TV, for example, has an almost 1 to 1 exchange rate (x1.02) whilst the MacBook Pro runs at a healthier x1.32 (although still nowhere near the official currency exchange rate of x1.62). I’ve added these ranges to the table below, along with the control data (price if you did a direct exchange conversion). As you can see, when you get to the top end there’s a difference of almost £200, which is not insubstantial. The elephant in the room is whether the iPad will be subsidised in the UK by mobile operators. It’s common here, as it is in the US, for mobile carriers to subsidise mobile phones. However, it’s also common here for mobile providers to subsidise the cost of laptops and especially netbooks. The only reason I can see for Apple keeping the price secret is that they’re waiting to get a deal sorted with a mobile carrier so they can release a subsidised version. This image shows the data I used to reach these figures. It’s actually a fascinating little data set that warrants further investigation. I certainly have some statistical questions I’d like to pose it. For example, which group of products generally fares the best when coming across the pond. I’d also like to expand it to include software and upgrades at some point in the future. Anyway, I hope you enjoy your expensive/cheap (delete as appropriate) iPad. If you enjoyed this post about Apple, you’ll probably also enjoy 2 Preview Hidden Gems, which helps you get the most out of OSX’s built in Preview.app. ive always thought the exchange rate used is the one thats prevailing at the time the product is launched/last updated. not that apple use the exchange rate only in the uk price – but that whatever formula they do use the exchange rate element is the one at the launch/update time. thats why you see the spread – there’s been a lot of volatility.